GO, ROUGH RIDERS! : Donna Walden, right, greeted Carol Fukunaga and Bert Kobayashi Jr. Tuesday as the Roosevelt High School Foundation celebrated the school's 75th anniversary with an eight-course Chinese dinner in the Hilton Hawaiian Village Coral Ballroom. Fukunaga (RHS '65) co-chaired the event with Judge Marie Milks (RHS '62). Kobayashi (RHS '58) was a section chairman, and Walden was a vice chairwoman (Walden's son, Corbin Dang, will graduate in '08). 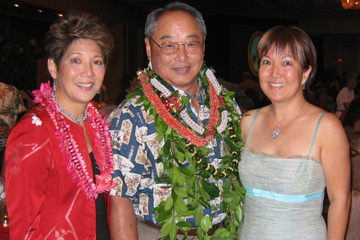 TWO GENERATIONS OF GRADUATES: Danny Kaleikini (RHS '55) shared emcee duties with Darah Dung (RHS '99), left, and her sister, Denby Dung (RHS '95). Kaleikini was in great form as always. He not only led the crowd in singing "The Star-Spangled Banner" and "Hawai'i Pono'i," but gave the prayer and played Hawaiian nose flute as well. Denby and Darah were outstanding representatives of another generation of RHS graduates, and two student groups -- the RHS String Quartet and the RHS Hula Performers -- showed there are still plenty of talented Rough Riders on campus. Cha Thompson, seated down front and center with Donna Walden, praised the performances of both groups. 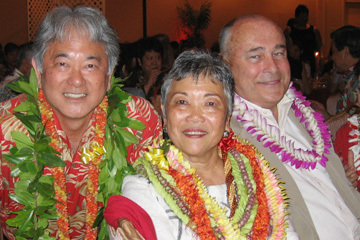 BUILDING FOR THE FUTURE: RHS Principal Dennis Hokama, left, welcomed co-chairwoman Judge Marie Milks and her husband, Bill Milks. Four months of work and the sold-out anniversary dinner netted $610,000 for badly needed repairs and improvements to the football field and facilities. THREE WINNERS: Benjamin Piwko , left, Alex Wirl and Kaula Naluai congratulated each other Tuesday after winning T-shirts at the Mai Tai Bar during the "Mai Tai Rumble" talent contest. Two of the competing bands -- Modern World and Tama Laule'a -- won spots in the "Rumble" finals to be held later this month. 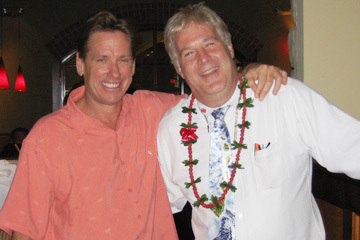 'SCUBA' KNOWS: Randy Schoch, left, shared a laugh with "Scuba Steve" Hagman Wednesday at Romano's Macaroni Grill in Ala Moana Center. Hagman was here teaching Schoch's employees about the things that make Romano's restaurants unique. This is the 52nd Romano's restaurant he has helped get up to speed.